Bus service • In contrast to multi-transit system operated by UTA, smaller Cache County and Park City systems don't charge patrons. Lee Davidson | The Salt Lake Tribune Buses from the Cache Valley Transit District pick up passengers at Logan's Transit Center. Lee Davidson | The Salt Lake Tribune Buses from the Cache Valley Transit District pick up passengers at Logan's Transit Center. Lee Davidson | The Salt Lake Tribune Buses from the Cache Valley Transit District pick up passengers at Logan's Transit Center. Francisco Kjolseth | The Salt Lake Tribune As the crowds descend on Park City for the Sundance Film Festival, buses keep a steady rotation to move the masses. Transit agencies in Park City and Logan do not charge fares. 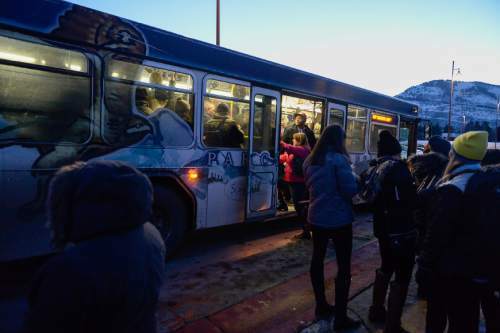 Francisco Kjolseth | The Salt Lake Tribune As the crowds descend on Park City for the Sundance Film Festival, buses keep a steady rotation to move the masses. Transit agencies in Park City and Logan do not charge fares. 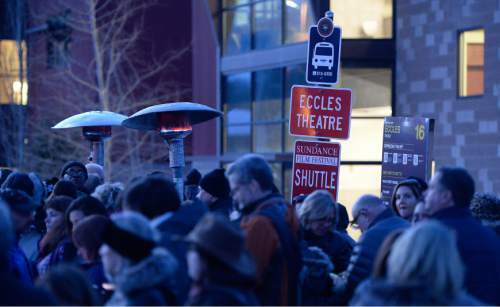 Francisco Kjolseth | The Salt Lake Tribune As the crowds descend on Park City for the Sundance Film Festival, buses keep a steady rotation to move the masses. 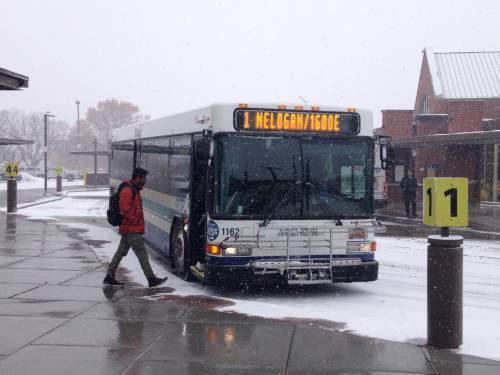 Transit agencies in Park City and Logan do not charge fares. 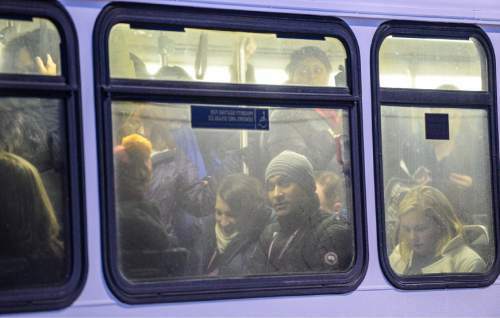 Francisco Kjolseth | The Salt Lake Tribune As the crowds descend on Park City for the Sundance Film Festival, buses keep a steady rotation to move the masses. Transit agencies in Park City and Logan do not charge fares. 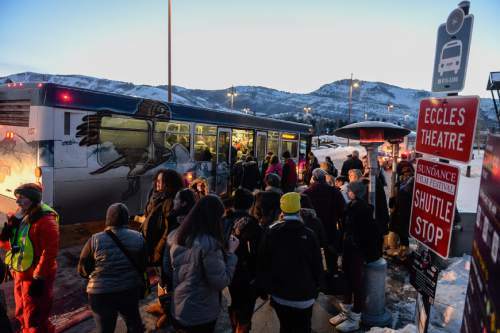 Francisco Kjolseth | The Salt Lake Tribune As the crowds descend on Park City for the Sundance Film Festival, buses keep a steady rotation to move the masses. Transit agencies in Park City and Logan do not charge fares. Francisco Kjolseth | The Salt Lake Tribune As the crowds descend on Park City for the Sundance Film Festival, buses keep a steady rotation to move the masses. Transit agencies in Park City and Logan do not charge fares. 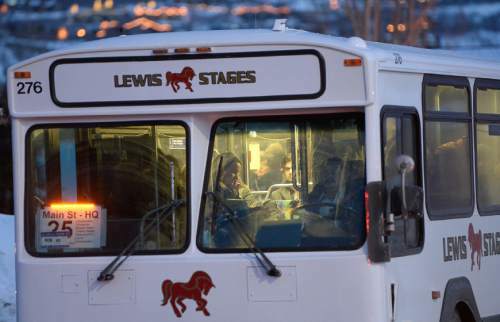 Francisco Kjolseth | The Salt Lake Tribune As the crowds descend on Park City for the Sundance Film Festival, buses keep a steady rotation to move the masses. Transit agencies in Park City and Logan do not charge fares. 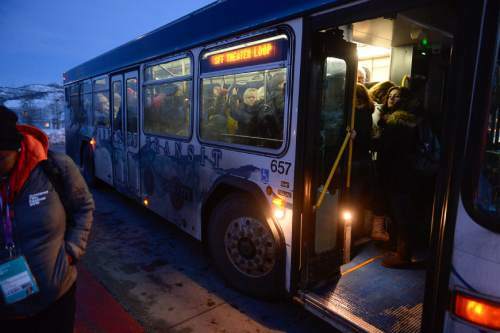 Francisco Kjolseth | The Salt Lake Tribune As the crowds descend on Park City for the Sundance Film Festival, buses keep a steady rotation to move the masses. Transit agencies in Park City and Logan do not charge fares. Logan • Brianne Palmer enjoys riding the bus in Logan. But the Utah State University student says she avoided transit in her hometown of Littleton, Colo., a suburb of Denver, even though that area&apos;s bus and train system is expanding. 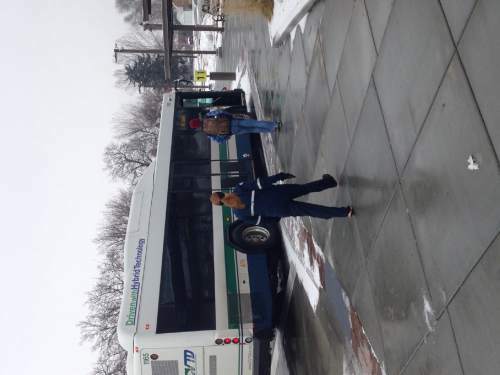 "It was inconvenient, too expensive and didn&apos;t go where I needed," she says as she waits for a bus inside the toasty Transit Center in downtown Logan, avoiding heavy snow outside. Why does she ride transit in Logan? "It&apos;s free." It charges no fares to anyone, anytime for its service throughout Cache County and even to Preston, Idaho. "If it did charge, I probably wouldn&apos;t ride it. I&apos;d probably just walk," she says, adding she&apos;s on a tight budget and has no car. "But on snowy days, it&apos;s nice to ride." 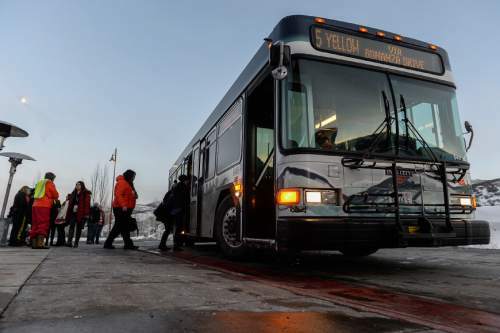 Both the Cache Valley Transit District and Park City Transit charge no fares  never have  maintaining that it helps attract extra riders to reduce congestion, improves air quality and aids poor people. Park City says the amenity also helps attract tourists and keeps them happy. Meanwhile, on the Wasatch Front, the Utah Transit Authority charges $2.50 for a standard one-way fare on its buses, light rail and streetcar. Cache and Park City say they have enough money without fares  while charging less in transit taxes than most areas in the UTA service area  that they do not object to erasing provisions of a new state law that were designed to bring them potentially much more. Legislation • "We don&apos;t really need all that extra money for transit in Cache County," says state Rep. Jack Draxler, R-North Logan, who is drafting one such bill. It would tweak a law enacted last year, HB362, that allowed 10 counties to pass Proposition 1 (seven others killed it) to raise sales taxes for transportation by a quarter-cent for every $1 in sales. In areas with public transit, the law requires 40 percent of that increase to go for transit, while the rest would go to cities and counties for roads. Cache and Summit counties did not put Prop 1 on their ballots last year. Draxler&apos;s bill would allow third-class counties  including Cache and Summit  to give transit agencies as little as a fourth of the now-required share for transit, and divert the rest to local roads. Those counties could also choose to give transit agencies up to what is now a full share, if needed now or in the future. Another bill, HB215, by Rep. Brian Greene, R-Pleasant Grove, would rewrite laws so that transportation taxes could be raised without any going to transit districts. "We&apos;re happy to accept less" than Prop 1 had mandated, says Roger C. Jones, vice chairman of the Cache Valley Transit District. Todd Beutler, general manager of that agency, adds, "We&apos;re very supportive" to help cities that may need the money more. "We definitely can operate what we have now with current funding. But, for growth, we would need to look at additional funding," says Blake K. Fonnesbeck, Park City transit and public works director. Cache officials say the same. When asked if UTA would similarly support changing how much it could receive through Prop 1-like initiatives, spokesman Remi Barron in a written statement merely said the agency is pleased that Weber, Davis and Tooele had passed Prop 1. Barron says that allows "for greater transit service in those areas with connections that will benefit others outside those service areas. We will continue to work with local leaders and the community to ensure we offer the services that they vote for." Free fare for all • Cache and Park City offer similar, but sometimes different, reasons for offering free fare. Cache Valley just finished a yearlong review about whether to begin charging fares. A hearing in September "was standing-room only," Jones says, and another 400 people offered comments online. Comments at the public hearing were 43-3 in favor of no fare. Online comments favored it by a margin of 89 percent to 11 percent. And a survey the transit board commissioned of 400 registered voters found the public favored it, 82 percent to 15 percent. Beutler says a study figured Cache Valley would actually lose money if it started charging fares. Adding fare boxes and other expenditures to collect fares would cost $712,000 to $1.1 million, analysts estimated. The change would also slow boarding times. Overall, the study calculated a 30 percent to 40 percent drop in ridership would occur because of costs and slower routes. Creating fares of 50 cents to $1, the study said, would not muster enough revenue to cover new costs. The agency would make a little if a $1.25 fare were charged, but the lower ridership would hurt county goals of reducing pollution and congestion and helping the poor, Jones says. "Air pollution is a problem here. And Main Street in Logan operates at near capacity," he says. He adds that one recent study said 31 percent of Logan residents are low-income, and only 6 percentage points of that is attributable to USU students. "So there is a need to serve the low-income, too." One young mother stood at the public hearing and said she had figured she had enough money either for milk for the family or gasoline for her car, Beutler says. Because of no-fare transit, she was able to buy the milk. For all those reasons, Jones says, the transit board last month "was unanimous in its decision to continue with free fare," but noted that may not always be possible. It has offered free fare since transit began in 1992. Park City is in its 40th winter of offering free fare, Fonnesbeck says. He says it started that way so skiers wouldn&apos;t need to fumble for change to ride. Now, no fare helps reduce traffic on the city&apos;s narrow mountain streets, cuts air pollution, and helps tourists move around town more easily. "People at the resorts have a real easy transportation experience," he says, adding it is partly why many want to return. He adds the city tries to offer more of a luxury experience with buses and trolleys "that have nicer cushions," and artwork that shows the area&apos;s history. It also operates every day of the year, including holidays, and late into the night  until 2 a.m. "We need to get all the workers and tourists home after late activities," he says. Taxes, services • Cache and Park City officials explain how they provide those free fares. Like UTA, the bulk of funding in Cache and Park City comes from sales taxes. Cache County charges a sales tax of 0.3 cent per dollar in purchases for transit, Beutler says, providing about 65 percent of funds (with 35 percent coming from federal grants). Park City charges 0.5 cent in sales tax. Fonnesbeck said that revenue and business license fees fund operations. The six counties in UTA&apos;s service area generally charge more in sales taxes. In Salt Lake County, it is 0.6875 cent per $1 in sales. In Weber and Davis, it is 0.65; Utah County, 0.526; Box Elder, 0.55; and in Tooele, 0.4. Weber, Davis and Tooele just raised rates by passing Prop 1. Voters in the other three counties defeated it. UTA raises 65 percent of its operating revenue through sales tax, according to UTA budget documents. Fares provide 14 percent (or $51 million a year); federal grants, 15 percent; and the rest comes from advertising, a portion of motor-vehicle registration fees and financial reserves. UTA figures it provides a tax subsidy of $3.77 for every passenger ride. Beutler says Cache Valley figures the subsidy there is $2 per free ride. Park City does not generate such a statistic. Cache has about 110 employees and 1.8 million riders a year in its countywide system. 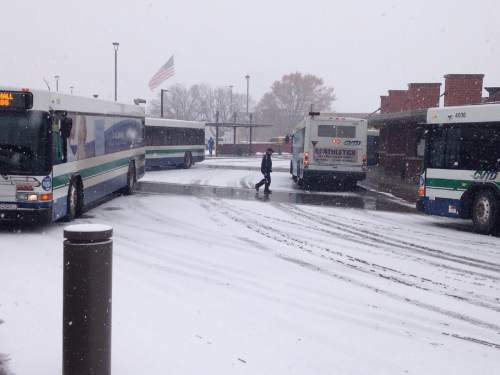 Park City Transit has 90 to 100 employees in its peak winter season and half that in summer. It also has about 1.8 million riders a year in the city area. UTA has 2,300 employees in its large six-county system that has about 45 million boardings a year. Fair comparisons? • UTA&apos;s spokesman says comparing his agency to small, local bus systems is akin to comparing apples to oranges because the smaller systems "offer a fraction of the service UTA does and fund their much smaller budgets in very different ways. UTA charges a fare like every other multi-modal transit agency in the country." He adds, "Not charging a fare would likely result in devastating service cuts." Both Cache and Park City also have relatively few managers, and salaries that are much lower than UTA. Controversies over high salaries and bonuses and extensive international travel by executives were listed by critics and supporters of Prop 1 as reasons for its defeat in Utah and Salt Lake counties. Fonnesbeck&apos;s total compensation, including benefits, in Park City  where he runs the city&apos;s public works department and its transit service  was $137,799 in 2014. The compensation for Beutler in Cache was $176,311 in 2012, the most recent available on the UtahsRight.com. Former UTA CEO Michael Allegra&apos;s total compensation in 2013 was $402,187. Cache has three employees who make more than $100,000 annually, Jones says, and they are essentially the only three managers the district has. "It&apos;s a lean operation," he says. But he notes that pay is still controversial and high for Cache County. So after some complaints, the transit district again brought in a company that examines salaries of comparable jobs and agencies  which said the pay level is justified. Still, Jones says, the board prevented raises for the three administrators for the past two years, but expects they will receive a raise this year. Beutler does travel to some national conventions, but says he has never gone internationally. He says his district has benefited from things UTA has learned in its travel. "We have a close relationship with UTA," which has offered tips when sought  and Cache patterned many policies after UTA policies. UTA spokesman Barron says since UTA was established in 1970, "the policy direction from elected leader has been to have the rider bear some of the cost, so as not to put the entire burden on taxpayers." 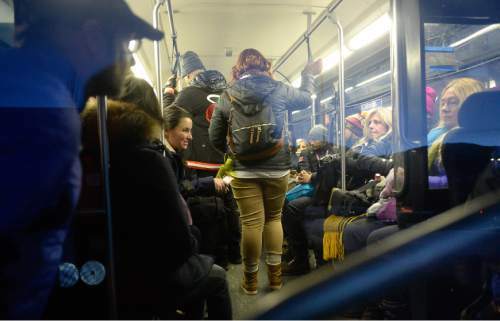 He adds that "not all small bus systems in Utah operate on free-fare budgets. St. George and Cedar City charge a fare of $1 and $1.50, respectively, for much less service than UTA provides." Also, with current promotions offering discounts for use of UTA&apos;s electronic FAREPAY cards, bus fares are as low as $1.50 a trip and TRAX fares, $2. Barron says that is "among the lowest [fares] in the country among transit systems of similar size, population and a comparable mix of multi-modal services."